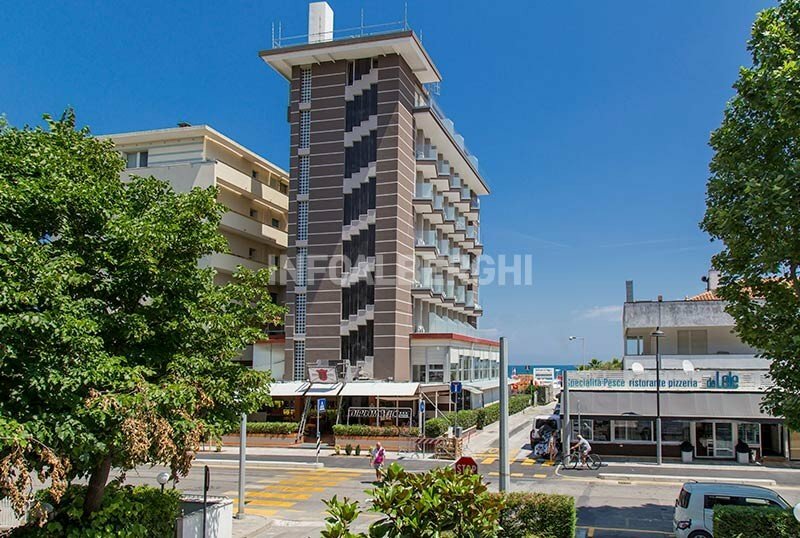 The Hotel Diplomatic, three stars in Riccione, with direct access to the beach, has a fenced parking, a garden, free WI-FI connection throughout the entire hotel and air conditioning. Admits small animals. Hotel Diplomatic is located in front of the beach, accessible without crossing roads. It is in the area north of Riccione, convenient for those interested in the nightclubs of the Marano or for those who want to reach Rimini easily, about 15 minutes drive away. The center of Riccione can be reached on foot in less than 20 minutes with a pleasant walk along the Lungomare or along Viale Dante. Each room has a balcony with sea view and is equipped with independent air conditioning, WI-FI, bathroom with shower and hairdryer, satellite TV and digital terrestrial, safe. The hotel has a garden, a furnished open-air porch, a panoramic restaurant, a lift, free bicycles and private cabins on the beach. PARKING: discovered in the hotel (15 seats), covered at 400 m from the hotel. BREAKFAST: sweet and savory buffet, served on the open-air porch. LUNCH AND DINNER: 2-choice menu, meat and fish for lunch and dinner, vegetable buffet and hors d'oeuvres. VARIATIONS: vegetarian cuisine, vegan cuisine on request. At meals: baby menu, high chairs, kitchen for mothers. The hotel overlooks the beah affiliated with the hotel, Bagno n.118, which can be reached immediately without having to cross the road. Here hotel guests can find: beach beach umbrella, sunbeds and private cabins, water aerobics courses, sports tournaments, group dances, entertainment, games for children. Price list is per person per day for min. 4 days. From 29 May to 14 June children up to 8 years stay free. Easter offer directly on the beach of Riccione! Easter Offer in Hotel directly on the beach of Riccione! Full board + drinks at meals + parking space, starting from € 58.00 per person per day. Easter Offer in Hotel directly on the beach of Riccione! Full board + drinks at meals + parking space, starting from € 58.00 per person per day. Children up to 5 years FREE, discounts for others. June offer in Riccione, Hotel directly on the beach, ideal for families. From 1 to 14 June, minimum stay of 2 days, in the All-Inclusive formula starting from € 63.00 per person per day. Until June 08, we will give you the beach for stays of at least 5 days.